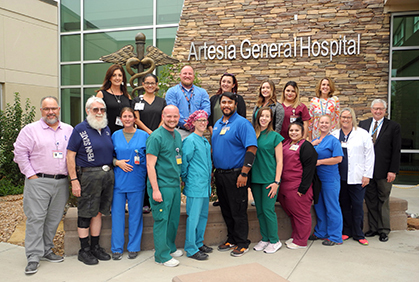 The Artesia General Hospital Scholarship Fund has aided the largest group of recipients since the program’s inception with their continuing education goals. A total of 19 scholarship recipients gathered recently at AGH to share how the scholarship has helped them expand their horizons. The Fund is organized and managed by AGH Foundation board member Joe Schiel, who says since the first scholarships were awarded in 2008-09, a little more than $70,000 has been distributed to AGH employees. “It’s really encouraging to see so many of you go ahead and further your educations,” said AGH CEO and Foundation board president Richard Gibson. “You not only enrich yourselves, you enrich the hospital.” Pictured are, back row from left, Ronda Clayton, RN, Chief Nursing Officer, and AGH Foundation board member; Claudia Valdez, John Riendeau, Kimberly Medley, Isabelle Lovato and Abigaile Jimenez; Julie Gibson, executive director of Business Development and Foundation board member; front row from left, Dr. Joe Salgado, Chief of Staff and Foundation board member; Schiel; Angela Houston, RN; Chad Johnson, Rochelle McIntire, RN, Ethan Fontanez, Samantha Dunnahoo, Carla Casares, Brandi Ford, RN, and Dawn Lyn Smith, RN; and Gibson. Not pictured are recipients April Davis, Arlene Nieto, Carlie Reyes, Krista Matthews and Laurie Pittman.